"Most people don't plan to fail, they fail to plan." Gerald Mwandiambira CFP® is the Managing Partner of Sugar Creek Wealth (SCW). SCW help our clients pursue their wealth management goals through careful advice, astute investment management and access to the capabilities and network of Global Solutions Providers. Gerald is a CFP Professional and a Director of The Financial Planning Institute of Southern Africa (FPI), he is postgraduate Financial Planning Law graduate and Economics graduate. 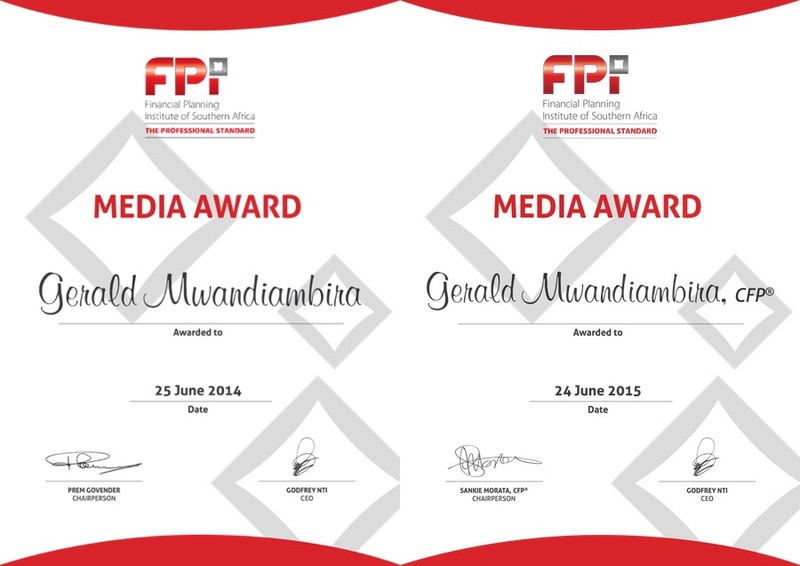 Gerald is the Financial Planning Institute of Southern Africa, Media Award recipient 2014 and 2015 for his work in promoting Financial Planning in the media. Independent advice on ALL of your risk protection, fiduciary and investment planning needs. In need of a public figure with in-depth financial insights? Want Gerald to be your Wealth Manager and Financial Planning Professional? Looking for a leading light to cast away the shadows of financial doubt? Need an audience to be inspired towards financial success? Some of my recently published articles from various sources.